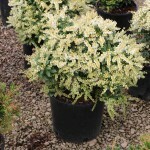 A dense shrub with lustrous, dark green foliage and clusters of bell-shaped white flowers in early spring. The new growth is bronzy pink. This plant is very compact. 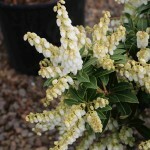 It prefers acidic, well-drained soil in full sun to partial shade. Use in mass plantings, in rock gardens, or the shrub border.